Electronic systems that improve vehicle performance; that add comfort and convenience; and that warn, detect, and take corrective measures to keep drivers safe and alert are being added to new cars each year. 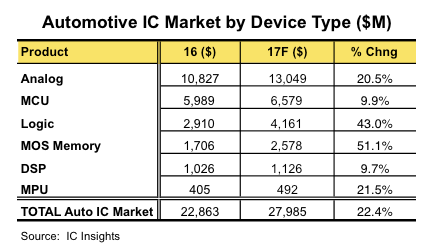 Consumer demand and government mandates for many of these new systems, along with rising prices for many IC components within them, are expected to raise the automotive semiconductor market 22% this year to a new record high of $28.0 billion (Figure 1). Over the past several years, the global automotive semiconductor market has experienced some extraordinary swings in growth. After increasing 11.5% in 2014, the automotive semiconductor market declined 2.5% in 2015, but then rebounded with solid 10.8% growth in 2016. It is worth noting that the sales decline experienced in 2015 was primarily the result of falling ASPs across all the key automotive semiconductor product categories—microcontrollers, analog ICs, DRAM, flash, and general- and special-purpose logic ICs, which offset steady unit growth for automotive ICs that year. However, in the second half of 2016, steadily rising ASPs (along with demand for the new automotive systems) helped return the automotive IC market to double-digit growth. In 2017, exceptionally strong increases in DRAM and flash memory prices are expected to help drive the total automotive IC market to an extraordinary increase of 22.4%. IC Insights recently revised its IC market outlook for 2017 and now shows DRAM average selling prices rising 50% in 2017, NAND flash ASPs increasing 28%, and the average selling price for automotive special-purpose logic devices increasing 34%. 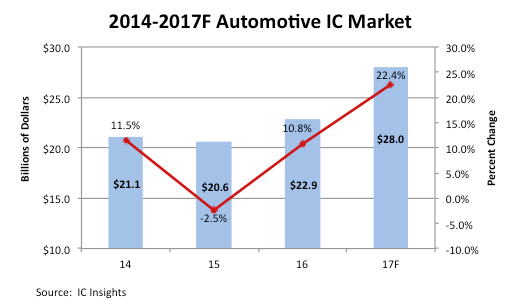 these strong ASPs gains, coupled with ongoing system demand, are driving the strong automotive IC market growth this year (Figure 2). Collectively, microcontrollers, analog, standard logic, and memory ICs used in automotive applications accounted for only about 8% of total IC marketshare by system type in 2016, but that share is forecast to increase to more than 10% in 2020, when automotive is expected to become the third-largest end-use category for ICs, trailing only the communications and computer segments. Through 2020, IC Insights anticipates that advanced driver-assistance systems (ADAS) will be the biggest user of automotive ICs. Various ADAS systems are currently helping cars and drivers remain safe on the road and they are proving to be essential building blocks to semi autonomous and autonomous vehicles that are being proposed for the next decade.